Well, if you tried the Sfakion Pie recipe I hope that you are not blaming me for your weight! If you started at the deep-end with the 10 Kilo lamb and the barbeque I sincerely hope that you are not fed up eating all that lamb - and has the fire gone out yet? 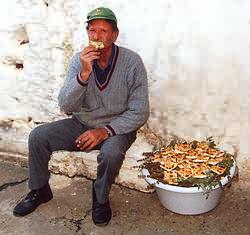 This time I bring to you, as promised, a classic of Cretan village cuisine. Kalitsounia. A la Zacharenia Papadaki and her daughter-in-law Nikki right here in Astratigos cooked in the very traditional way - the brush fired outside oven operated by Zacharenia's husband Michaelis. Although you can buy ready-made, frozen Kalitsounia here in almost any store selling food, or the necessary ingredients including ready made pastry, to produce the true village quality a number of happenings must come together at the right moment for the magic to work. The first of course is the possession of a real Cretan mountain village........! But! We can follow this genuine recipe and the cooking and come up with something very, very, nice even if we don't have the village.. This recipe will make about 25 kalitsounia. Mix the ingredients for the pastry together well and make into filo pastry by rolling several times through a pasta-making machine. If you don't have one do the same thing with your rolling pin! When you have sheets about 0.25 cm thick cut the pastry into 12 centimetres square. Place about 1 level desert spoon of the cheese and chopped spinach filling in the centre. Fold each of the four corners to the centre, creating an 8cm square (photo above) packet ready for a little egg and sesame seed glaze applied immediately before cooking in a very hot oven for about 5 minutes. The reality is of course a little different and much more exciting. In the village here the oven is an outside kiln-type Greek affair manufactured from a very large clay pot (Pithari) set in concrete. Nikki Papadaki house, in which the Kalitsounia are made, is away across the village from the house of Zacharenia, where the the Kalitsounia will be given the final egg brush before being placed on grease-proof paper and put in round aluminium baking dishes in batches of 12 or so. 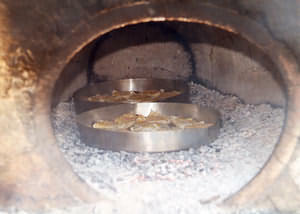 The oven outside is manned by Michaelis - Zacharenia's husband, who does the actual baking. They usually make at least 400 at once. While Nikki and Zacharenia start the process by preparing - cooking meat (for another purpose), preparing the filo pastry using some of the stock, Michaelis, way across the village is collecting highly flammable dry brushwood and placing large pieces in the outside oven. The kalitsounia, laid out on a wooden board 200 at a time. 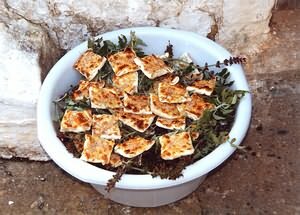 are then carried across the village to Zacharenia's house where the final preparations are completed with the Kalitsounia in the baking trays. Michaelis fires the oven and when it is ready - maybe 5 minutes - loads the two full trays into the oven with a large wooden paddle and seals the entrance with a metal plate. When he removes the trays 5 minutes later absolute gastronomic perfection awaits. With a metal sheet sealing the door of this very basic brushwood oven 5 minutes saw 24 or so Kalitsounia cooked to absolute perfection on the white hot brushwood embers. At least one of the cooks did!